^ "The Legislative Council's History". Information Sheet 7. 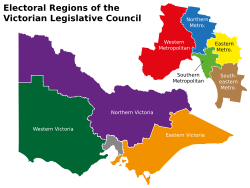 Parliament of Victoria. Retrieved February 26, 2011. 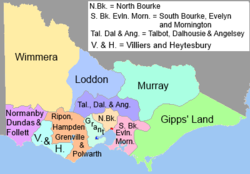 ^ "Victorian MPs get $2713 pay rise. Next year it could be a lot bigger". William Summers. 29 Jun 2018. Retrieved 22 Nov 2018. ^ "PARLIAMENTARY SALARIES AND SUPERANNUATION ACT 1968 (amended)". An Act relating to Parliamentary Salaries and Allowances and Parliamentary Superannuation and for other purposes. Parliament of Victoria. 1968. Retrieved 22 Nov 2018. ^ "Parliamentary Salaries and Superannuation (Allowances) Regulations 2013 (amended 2017)" (PDF). An Act to provide for the allowances payable to members under section 6(1)(e) of the Parliamentary Salaries and Superannuation Act 1968. 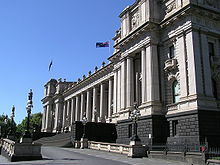 Parliament of Victoria. 2017. Retrieved 22 Nov 2018. This page was last edited on 18 April 2019, at 03:21 (UTC).